KIEV, Ukraine -- Ukraine's Ministry of Foreign Affairs has warned European politicians and other foreign nationals that they could be banned from entering Ukraine, if they visit annexed Crimea without Kiev's permission. 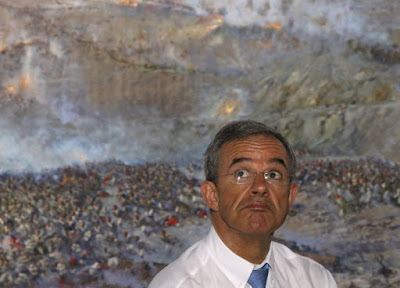 Thierry Mariani, a member of the Foreign Affairs Committee of the French Parliament and vice-president of the France-Russia friendship group, watches the "Defence of Sevastopol in 1854-1955" panorama in Sevastopol, Crimea, July 24, 2015. Armed men in military attire, but without specific military marking, seized Crimean public buildings in February 2014 while Ukraine's pro-European Maidan revolution gripped other parts of the country. Russia has denied that the men were Russian soldiers, as is widely believed, however the forces subsequently helped stage an internationally unrecognized referendum the following March, which saw the peninsula join the territory of the Russian Federation. The mysterious troops currently have both a monument and a holiday dedicated to them in Russia. Ukraine has since made it illegal for foreign nationals to travel to Crimea without firstly obtaining authorization from the Ukrainian government. Those who receive this authorisation must then only pass through designated entry points in the Ukrainian regions of Kherson or Mykolayiv. Last month, despite the condemnation of the French government and Assemblée Nationale, 10 French parliamentarians, largely from Nicolas Sarkozy's Les Républicains party, met with Russian politicians in Russia and then travelled to Crimea, led by MP and former Transport Minister Thierry Mariani. Italy's anti-establishment Five Star movement told Russian newspaper Kommersant last week that they are planning a similar trip in October, while Russian newspaper Izvestia cited Alexander Neu from Germany's Left-wing Die Linke party that they too would consider a visit to Crimea. Neu praised Mariani's trip as "a correct and exemplary decision". After his return Mariani told French radio station France Info, that he is planning another trip to Crimea in the autumn, despite facing heavy criticism at home. When asked for a response to such reports from the Ukrainian government and to comment on European MPs planning unsanctioned visits to Crimea, the Ministry of Foreign Affairs told Newsweek that all foreign nationals will face consequences for not adhering to regulation on visiting Crimea. "We once again urge all foreign citizens to strictly adhere to the laws of Ukraine and international law. We will adequately respond to any violations of the established order," a media official at the ministry told Newsweek. "Respective restrictions, defined by the legislation of Ukraine, including the ban on entering the territory of Ukraine, will be applied accordingly." The Ministry highlighted that "all foreign States and international organizations" have been notified about how their employees can legally visit the peninsula, since the resolution on the procedures for entering Crimea came into force in June. When asked to comment on any potential trips to Crimea by European politicians, a spokesperson for the European Commission referred Newsweek to the current restrictions imposed by all EU member states on Crimea, including a ban on tourist ships docking in Crimea, except during an emergency and a ban on European experts providing technical assistance to Crimean companies. A spokesperson for the European Parliament President Martin Schulz said that Strasbourg does not comment on national MPs, but added that the institution condemns "in general terms any such trips or activities undermining European unity, going contrary to the EU position or which try to legitimise Crimea's unlawful annexation."